The dates for the start of the new lunar year change every year, so when is Chinese New Year in 2019? Chinese New Year is based on the lunisolar calendar, which differs from our solar Gregorian calendar. This causes the dates for Chinese New Year to vary each year. The 15-day festival, arguably the most widely celebrated holiday in the world, begins in either January or February. Chinese New Year 2019 Begins on February 5. The Year of the Pig begins on Tuesday, February 5, and will continue until the Year of the Rat takes over on January 25, 2020. The Chinese New Year holiday will run for 15 consecutive days and finishes with the Lantern Festival. Public celebrations around the world will consist of fireworks, lion dances, and performances. Meanwhile, millions of families will quietly observe old traditions for the start of a new lunar year such as enjoying food, good company, and a fresh start. Even if you don't buy into any of the superstitions, Chinese New Year provides a second chance to start anew for any resolutions from December 31 that have already fallen! Chinese New Year parties are becoming a fun, cultural trend in the West. Think of the holiday as a good excuse to gather a few friends during the winter for food, drinks, and sharing memories. The Pig is the twelfth and last year in the 12-year cycle that makes up the Chinese zodiac. After this lunar year, the cycle resets again with the Year of the Rat. Mythology claims that the pig was the last of the animals to arrive when the Jade Emperor called for a meeting. The Pig sign is considered to be "yin" and a water sign. The closest Western zodiac match is Scorpio. Your Chinese zodiac animal is determined by your birth year. 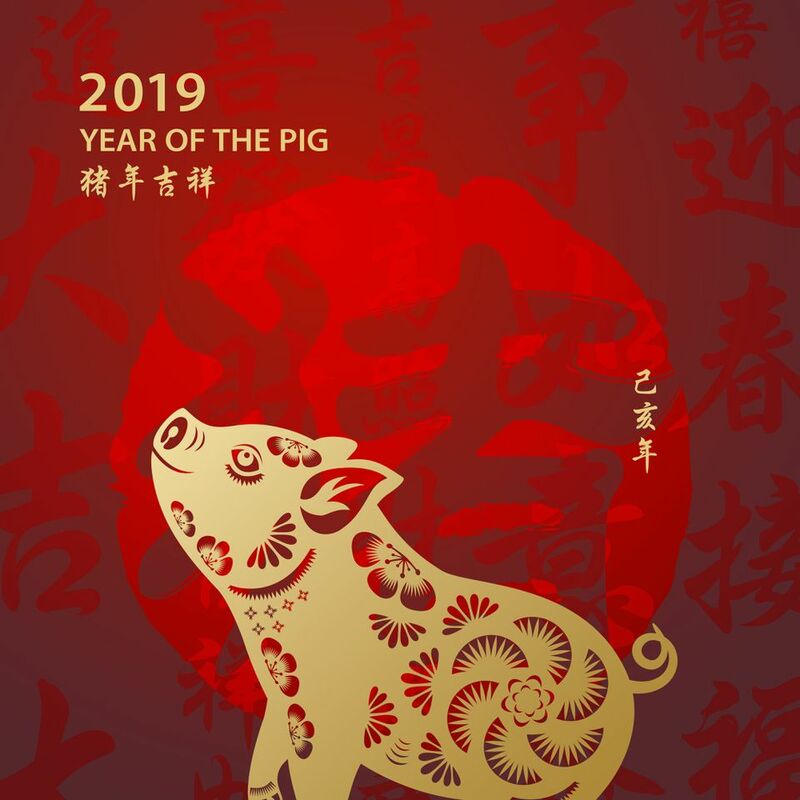 If your zodiac animal is the Pig, superstition suggests that you should tread carefully during 2019 as it is your ben ming nian. The idea is to not accidentally offend Tai Sui, the god of age in Chinese mythology. Big life changes (getting married, starting a business, etc) should be approached carefully or postponed until the following year. If you were born in a Pig year, superstition says you can wear a piece of jade or a red ribbon to help negate the effects of this being your "unlucky" year. Part of preparing for Chinese New Year includes getting your home ready to receive as much good fortune as possible for the upcoming year. Clutter should be removed, drawers emptied, floors swept, and everything thoroughly cleaned before the Chinese New Year holiday. On the contrary, sweeping or cleaning during Chinese New Year is taboo as you may accidentally sweep away incoming prosperity! Plants should be pruned because cutting (even noodles while eating) during Chinese New Year is unlucky. Attention is given to personal preparation as well. You should get a haircut, clip nails, and find a new outfit to wear — preferably one that hasn't been worn before . Red is the most auspicious color, followed by gold. If you can't find a way to incorporate vivid red into your attire (even a scarf or bracelet will work), do as some people do and go for red underwear! Some quick ways to say "happy new year" in Chinese are with gong xi fa cai (sounds like "gong zee fah tsai") or xin nian kuai le (sounds like "zheen neean kwai luh"). The dates for Chinese New Year are based on the Chinese lunisolar calendar. Although in the West we most frequently refer to the holiday as "Chinese New Year," it's celebrated in many cultures, not just Chinese. For instance, the dates are the same for Tet, the New Year celebration in Vietnam. Chinese New Year can also be referred to as the "East Asian Lunar New Year," or frequently, simply as the Lunar New Year. The latter is common, however, some Lunar New Year celebrations that are not based on the Chinese lunisolar calendar do not coincide with Chinese New Year. For example, the dates for the Islamic Lunar New Year move backwards through the Gregorian calendar and aren't restricted to just January or February. Songkran in Thailand (April) and Nyepi in Bali (March or April) are other examples of traditional Lunar New Year celebrations that do not coincide with Chinese New Year. Regardless, these places also celebrate Chinese New Year in different ways. Since 1873, Shogatsu — the Japanese New Year celebration — was changed to January 1, same as the West. The Lunar New Year is not an official public holiday in Japan, but it is observed traditionally by some people.